I wasn’t really in the best of conditions when doing this photoshoot, so forgive me if some of the shots are off-focused. It bothers me a lot, but I couldn’t be damned to go back and do everything again. Now, while my Justice is mostly straight-built, I did add some details in by hand here and there, most notably around the head, where the camera sensors and eyes are all painted in. 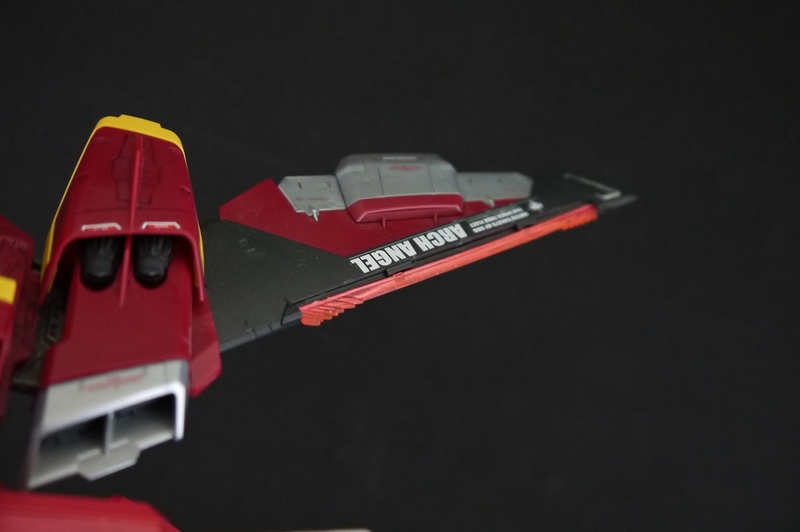 I also applied a good amount of water slide decals, including a custom one on the left shoulder. 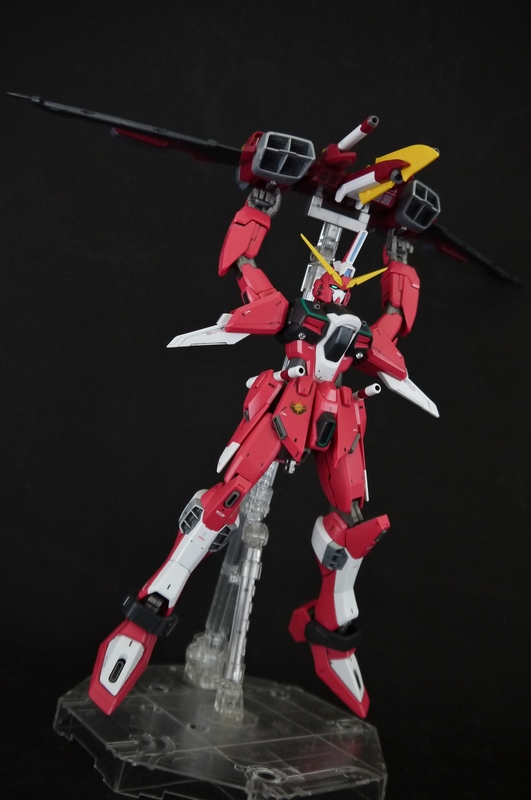 It didn’t really make sense to me why FAITH decals were included with this kit, when Athrun had already defected from ZAFT by the time the Infinite Justice even appeared on the scene. 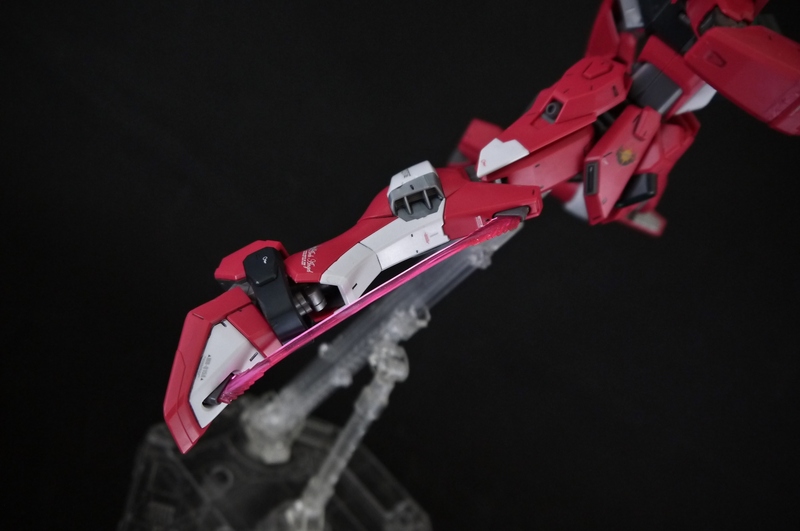 As such, I applied the FAITH decal and cut out one of the big red “X”‘s from some of the GAT-X decals and applied it over. 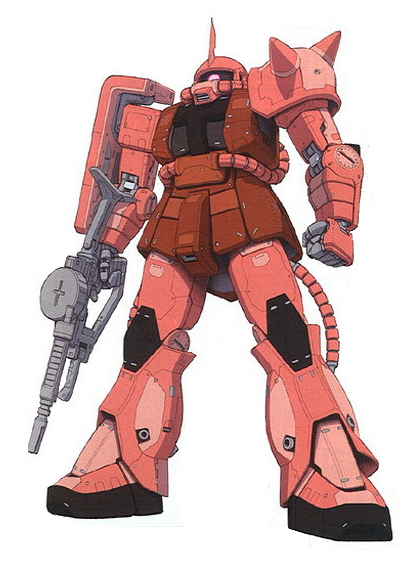 The justice is a very distinct pinkish red; it’s not Lacus Clyne Concert Zaku pink, closer to Char’s Zaku II pink. Given the unit’s design (it has a glider tacked onto its back for crying out loud) it’s not exactly ideal or meant for ground poses. But I tried anyway. Really belongs up in the air. 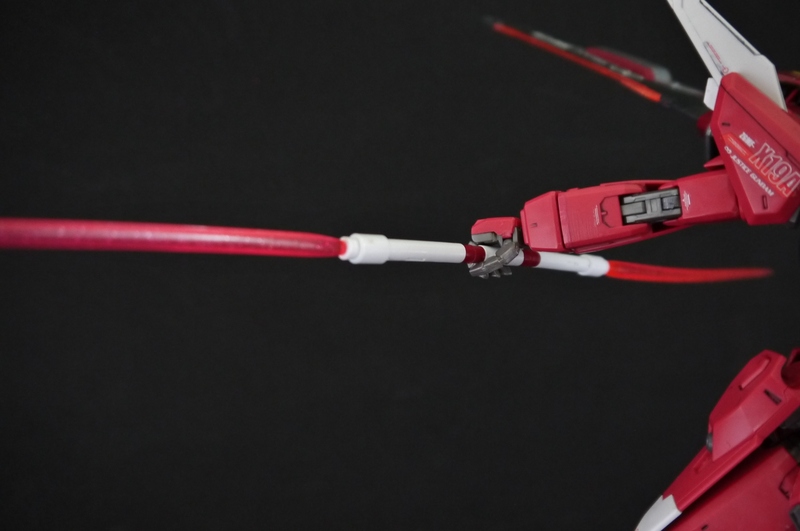 Like most Master Grades, Infinite Justice comes with a dedicated crotch connector piece that pegs into a standard Bandai Action Base 2. 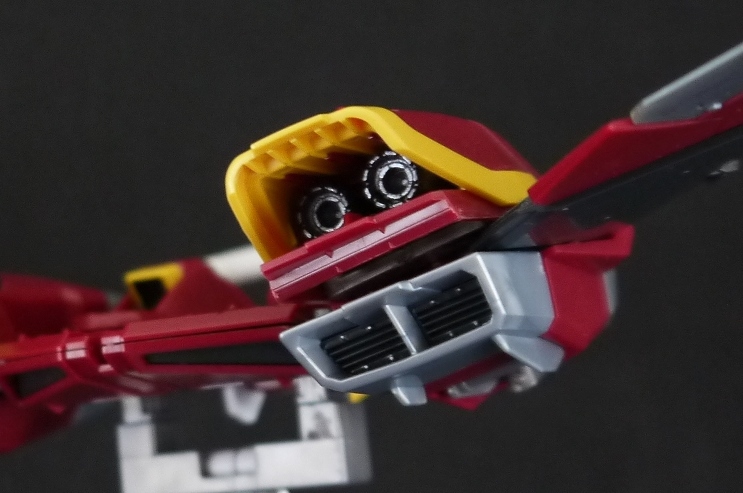 There’s also a separate connector for the Fatum-01 that could also hold the Justice up, but I’ll get to that later. 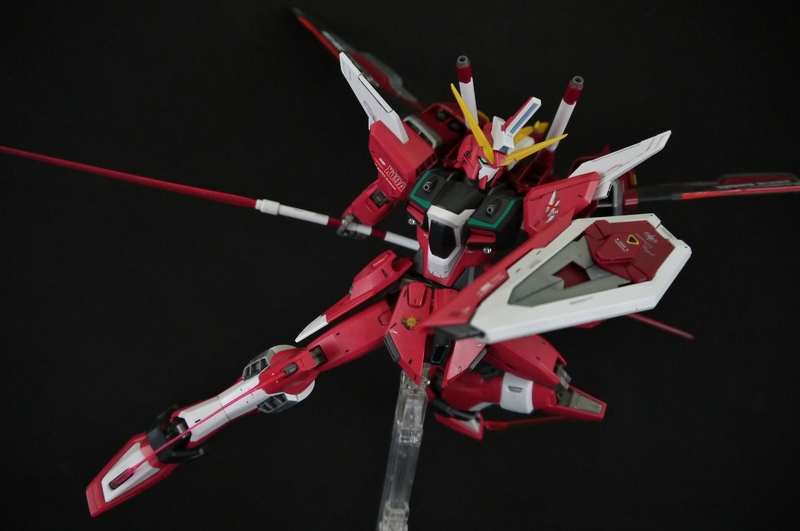 Justice uses the same beam rifle as the Strike Freedom, nothing really fancy about it other than an adjustable scope. 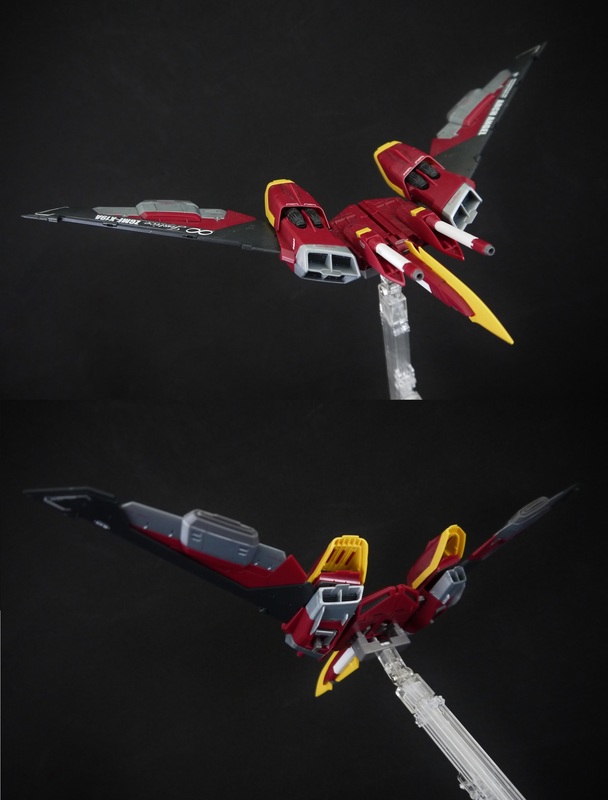 The Fatum-01 (so-called because the original Justice’s glider was apparently the Fatum–00) is a fairly large sub-flight system that spends most of its time tacked onto Justice’s back. 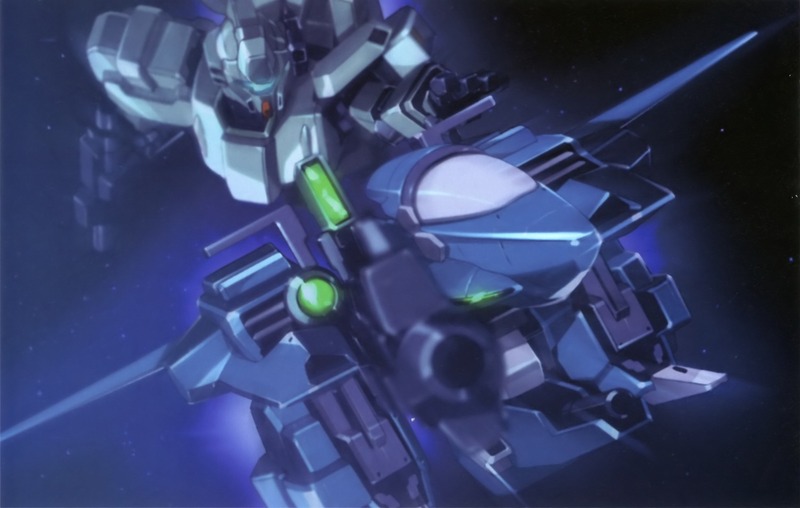 Apparently this thing can also be AI controlled by Athrun, and is the only part of the Justice to really sustain “damage” in the final battle of Messiah, having been kamikazed into the Requiem. This thing is actually pretty loaded, both with gimmicks and overall armaments. The wings are on a gear system, so pulling the engine blocks out will automatically swing the wings out. 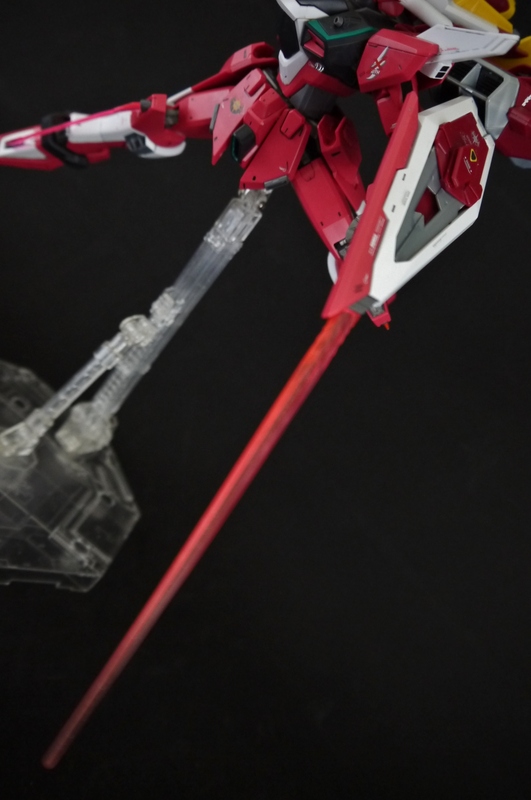 The “Hyper Fortis” beam cannons can also swing forward and slide forward on a slight rail, and the thing has beams on its wings for slicing, Gaia-style. Beyond the incredibly detailed thruster work, the thruster caps themselves also slide forwards and backwards for no real reason other than to give the thing another moving segment. I find this method substantially more silly-looking. HOLD MY BEER KIRA, I’M GOING IN! I guess there’s a reason why this was never featured in the show proper. 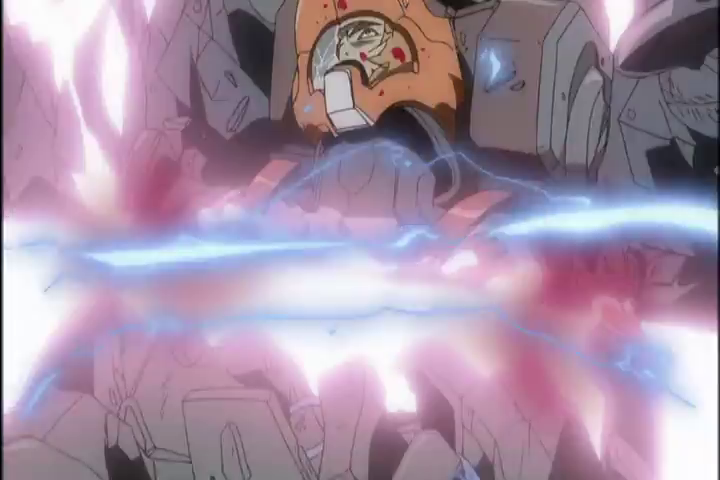 Shinn cries in his sleep. All the beam effects (including the shield) actually have some silver glitter sparkles imbued in them…I’m not really sure why, as I don’t really remember Justice’s weapons sparkling in-series, but it’s not overtly noticeable. It does make differentiating this thing’s accessories with that of my other kits substantially easier though. 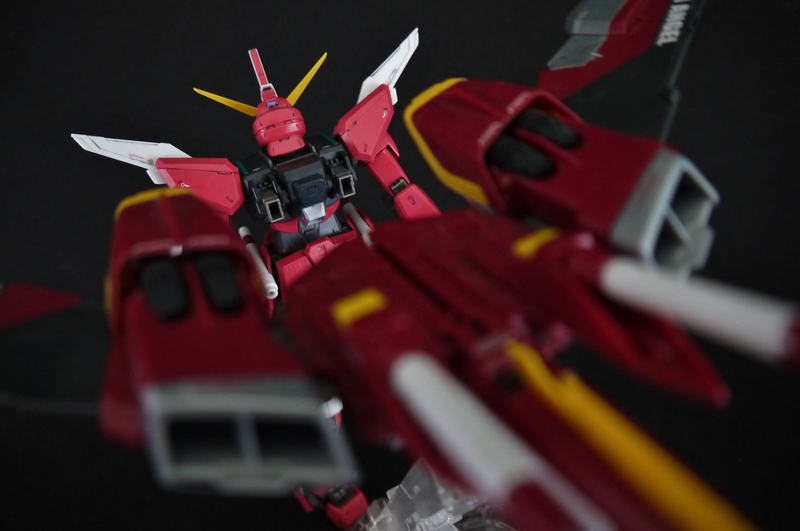 The beam saber hilts are really interesting. Due to the double-bladed gimmick where both hilts are combined into one, we get three pommels in total – two separate individual ones and a single piece that represents the two pommels joined. 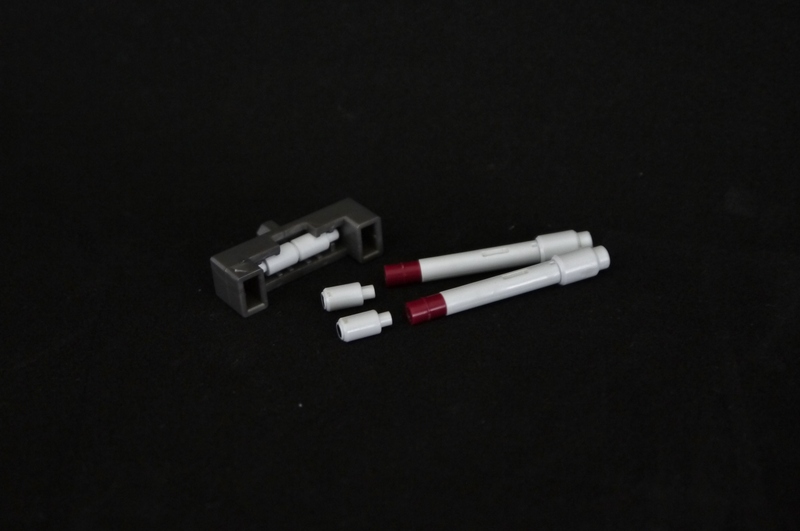 What’s nice is that Bandai is courteous enough to allow whatever pommels aren’t being used to be stored in the Fatum-01’s action base connector, as shown. With such tiny pieces, it’s no surprise that they’d be lost easily, so the action base storage piece is extraordinarily efficient. There are pegs in the Justice’s palms that the hilts fit into, which makes for a very sturdy connection. Unfortunately, the same cannot be said of the beam sabers in their hip sockets. One of the most annoying aspects of this kit is the fact that the beam sabers can’t stay in their mounts. The sockets themselves do have little pegs that the sabers are meant to slot into and stay in place with, but they don’t work particularly well at all. The slightest breeze will send them tumbling about. Halfway through this photoshoot I wanted to be done with this kit and sell it off as soon as I could because of the annoying little hilts rolling all over the place. Darth Maul style. The connecting pommel piece actually has a groove in it so the Justice can hold the combined sabers at exactly the middle point, instead of having to wield it using one actual saber hilt or the other. 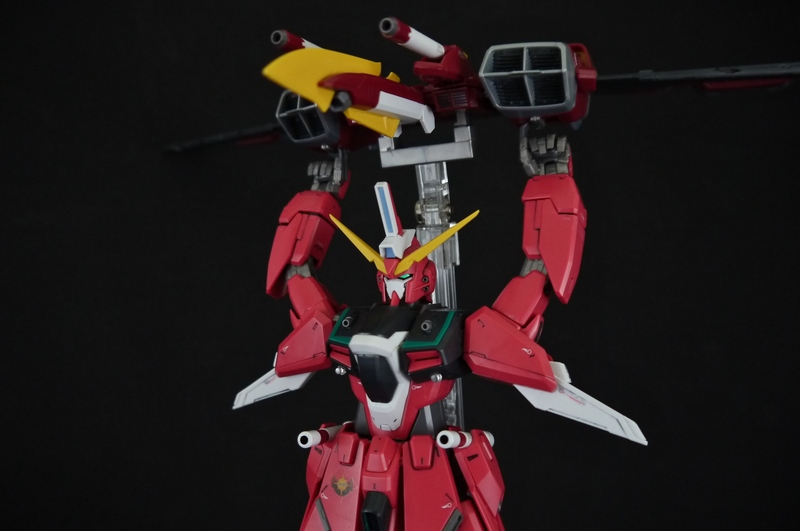 Justice’s physical shield sports a beam shield generating mechanism, unlike Strike Freedom’s generators which are just mounted directly on the forearms. Having that big blue hunk of clear plastic mounted on the side of the arm proves to be a bit cumbersome; thankfully the physical shield has a handle that pegs into Justice’s palms in an open position. Justice’s physical shield also mounts a few built-in weapons, one of which is a cute little grapple stinger. A cable of fair length is included, and the actual claw/stinger at the end is light enough so that it doesn’t sag. Nothing too remarkable; Blitz still does it better. 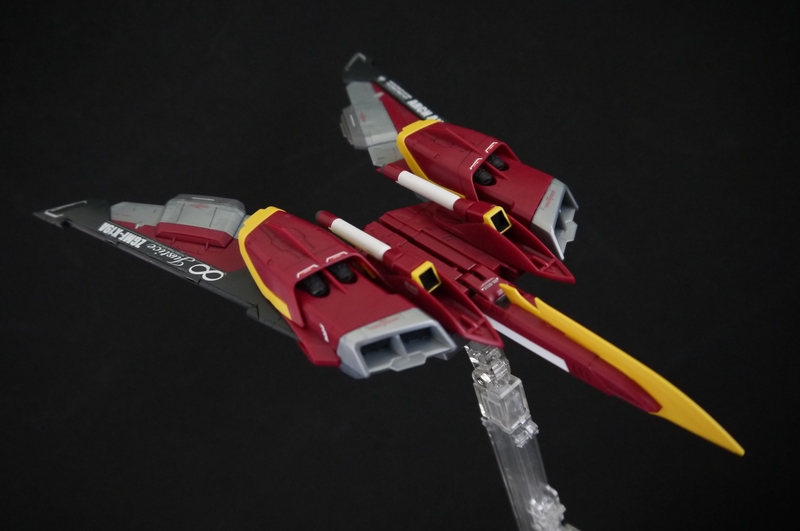 We also get a two-in-one-combo with the “Shining Edge” boomerang. When attached to the shield, it can be used as a beam saber; when wielded in-hand, the beam emitter can bend and become an actual boomerang. 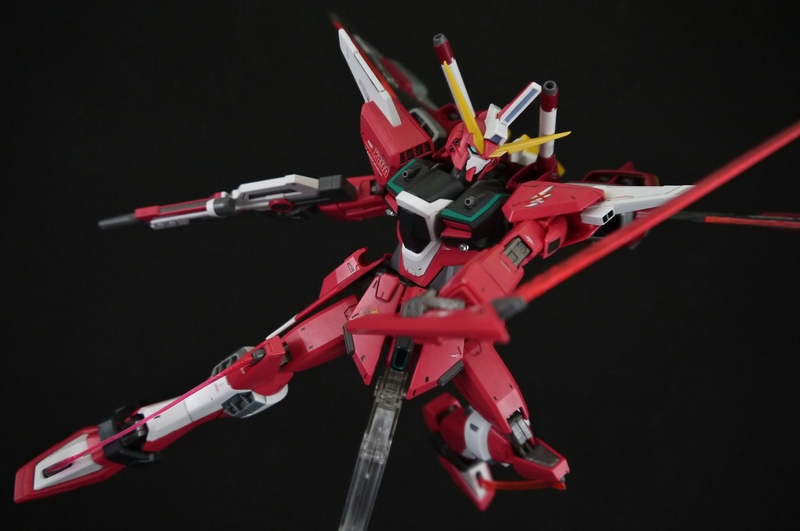 Too bad no effect pieces are given to show the boomerang in action though; I’ve only ever seen anything of the like with the MG Destiny Gundam Extreme Burst. 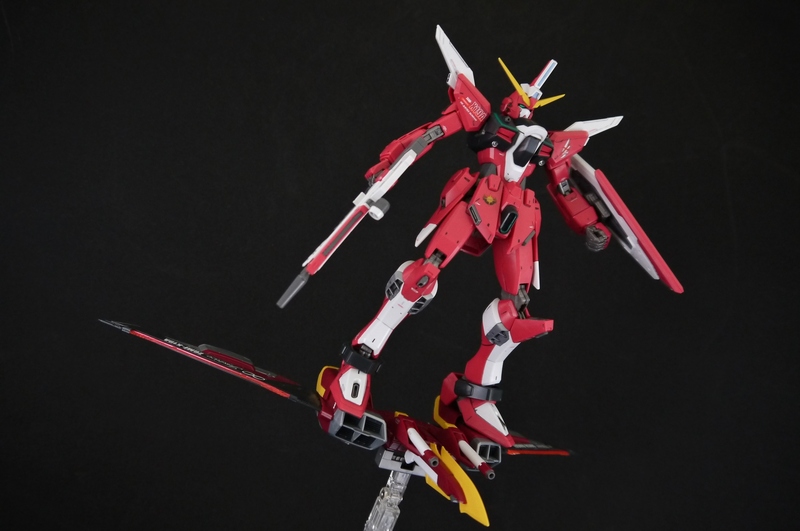 And lastly, probably the Justice’s most unique feature – beam sabers on the legs. 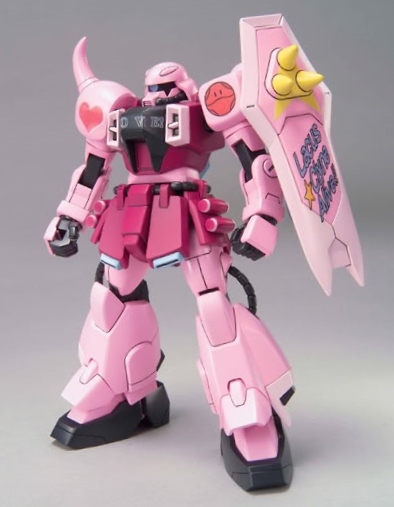 This actually seems like a really practical weapon system to me, and am surprised more mobile suits haven’t featured it. Why have regular kicks when you can have beam kicks? 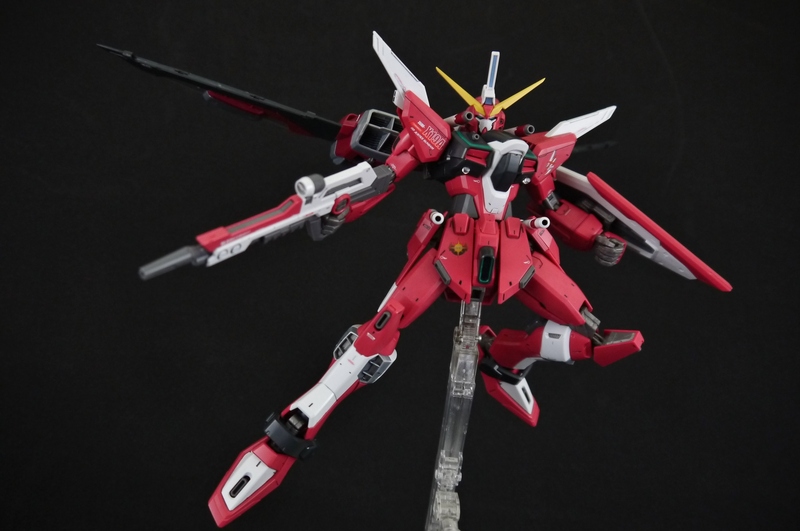 Athrun’s also been known to kick beam boomerangs and the like away using these. We get two long beams that are for when the foot is extended downwards, and one short beam for having the beam active while the foot is more at level ground. Generally the beams plug into the articulated slots on the knees and top of the feet with little problem. 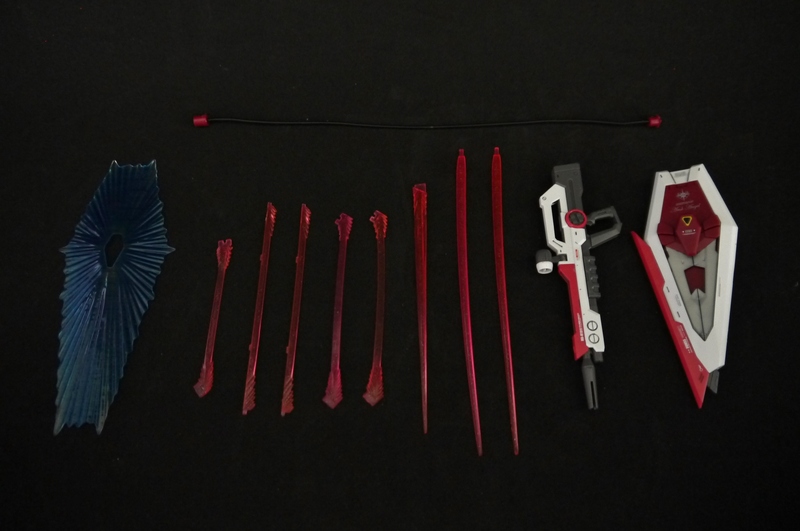 Probably the greatest thing about this kit though – the Justice can literally utilize every single armament it comes with at once. From the beams on the legs to the grapple stinger and beam boomerang – most of its weapons are hands-free, so it only actually needs to hold its beam rifle and beam sabers. The disadvantage here is that the Justice relies solely on beam weaponry in combat, though its not like it would be going up against the likes of the Sengoku Astray. Now, while I do like this kit for what it is, the suit design isn’t doing much for me. Make no mistake, everything does look downright gorgeous, especially in Master Grade form, but its a kit that’s just a bit too cluttered for my tastes. I’ve never really dug suits with a whole mess of weapons and extra add-ons, or giant wing-packs and wing binders. I’m more fond of bare-bones suits. The Infinite Justice just reeks overpowered to me, with all its capabilities and overwhelming weapons layout. 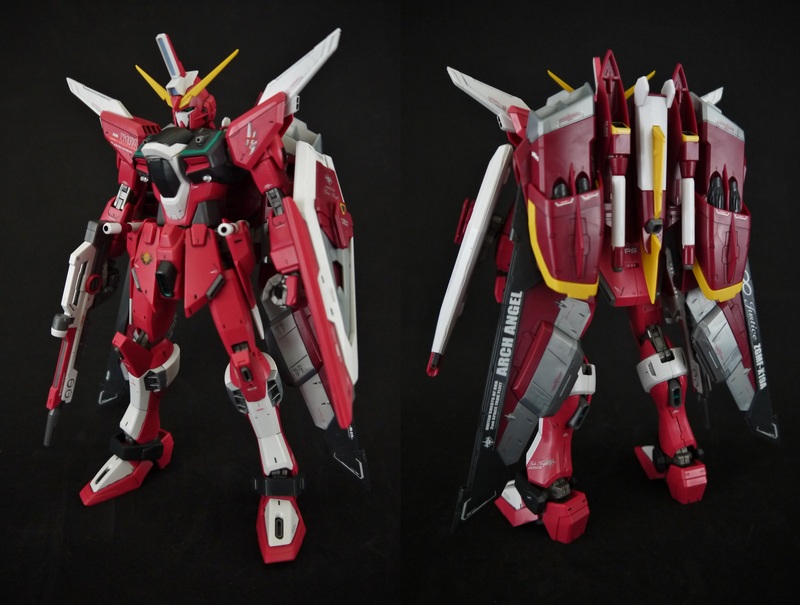 The Justice would make a great display with a MG Strike Freedom and MG Destiny, but I’d be weary of some loose parts; stuff does like to fall off often, and if you’re not careful you’ll quickly lose track of a beam saber hilt.